Crewe Alexandra are considering whether to offer a deal to on-trial defender Zoumana Bakayogo after almost two injury-hit years out of the game. The 29-year-old ex-Tranmere Rovers and Leicester City left-back has not played since rupturing his anterior cruciate ligament just 37 minutes into his debut on loan at Yeovil in January 2014. 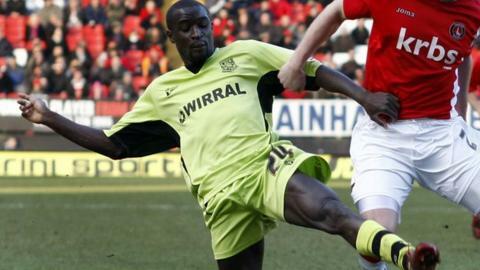 "We're providing a base to get himself going," said Crewe boss Steve Davis. "We certainly know he's good enough," Davis told BBC Radio Stoke. "I remember him bombing down the wing at Tranmere causing us heaps of problems. He got player of the season there before going to Leicester." The French-born former Ivory Coast Under-23 international was released in the summer by Leicester, for whom he managed just two League Cup appearances after leaving Tranmere to join the Foxes in July 2013. But Bakayogo, who still has a home on Merseyside, has been making the short daily journey to Crewe's Reaseheath training ground in a bid to get his career going again. "We haven't made any decisions either way," said Davis. "He came to us pre-season with a view to us having a look at him, when we were looking for a left-back, before we signed Stephen Kingsley. "His knee was in poor condition. He'd had a couple of cruciates and had been out for two years. There were doubts about those injuries and we wanted to take a look at him, but he's answering those questions at the moment. He wants to get back playing professional football." Davis's Crewe still sit bottom of League One, having won just three times in 16 games this season, ahead of Saturday's FA Cup first round date at home to non-league high fliers Eastleigh.